"The hydraluron™ hydration effect: benefits. 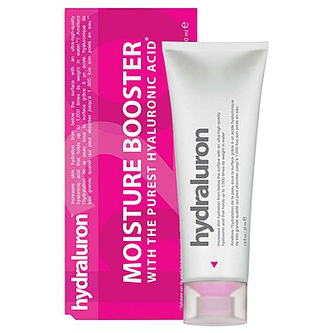 hydraluron™ moisture boosting serum is proven to boost moisture levels in your skin daily. This is the ultimate daily facial moisture boosting serum that starts where your moisturiser stops. hydraluron™ moisture boosting serum contains a pure form of hyaluronic acid, an incredibly hydrating ingredient that holds up to 1,000 times its weight in water. Red marine algae helps provide maximum delivery. The result – better hydrated, nourished, plumped up looking skin. Give your skin a daily dose of hydration and integrate hydraluron™ moisture boosting serum into your skin care regime. Moisture relief is on the way." Apply a pea-sized amount of hydraluron™ moisture boosting serum on cleansed face AM and PM. Follow with a moisturiser. Use daily for optimal results. Water/Aqua/Eau, Propanediol, Sodium Hyaluronate, Ahnfeltia Concinna Extract, Carbomer, Butylene Glycol, Disodium Edta, Sodium Hydroxide, Phenoxyethanol. Short list of ingredients. Adds moisture to skin. Scent-free. Easily absorbed. The tube packaging is awful. Expensive. I was really eager to try this product as it is raved about by beauty bloggers. I don't know whether my skin is too dry rather than dehydrated but I did not get the spectacular results that other's do. When I first used this I was really disappointed as I found my skin felt dry after use and I started using it to boost the serum and moisturiser on top of it. I then felt that this was ridiculous, adding an extra and expensive step to my beauty routine, so I stopped. Going back to the product having finished my serum I am more impressed. It does seem to add moisture and make other products go further. Perhaps it is a Spring/Summer product and you need to go for something more substantial in the Winter. The gel is clear and scent-free, which I appreciate. It is easiy absorbed into the skin. My one remaining bugbear is that when you stand the tube on it's lid end the product comes out far too quickly, which leads to a lot of waste. It also oozes out after you have squeezed out the amount you need, again leading to wastage. If it was a cheap product this might be forgiven but this is not cheap. Ultimately, I would say "give this a go" if you have normal skin but if you are looking for specific results, buy a serum that targets those issues.